TimeHop is up there with my top 5 favorite apps. Trailing behind the TripleTown, fart noise app, Spotify… the usual. In my time hop yesterday was a couple photos from a year ago; a day when Kent was visiting in me in Orlando. We were laying in bed while he scrolled through instagram and I saw a girl had posted a stitched bat with “bite me” underneath. Not in a cutesy halloween way, but a “I’m trendy and love bats and stuff” kind of way. That’s besides the point – the point being that I liked it. This led to a string of google searches, an Etsy purchase, and shortly after, I demanded Kent take me to Joann’s. (Mind you, these are the days of no transportation por moi). This story could quickly segway into a Kent appreciation story – he took me to Joann’s to buy stitching supplies, then wandered IKEA with me for hours and ate plates of meatballs. The TimeHop picture was before and after my feast of swedish meatballs, btw. I get asked allll da time, my two favorite places to get patterns from are Satsuma Street on Etsy & Frosted Pumpkin Stitchery. Oh lawd – this is embarassing. I didn’t realize that you separated the floss into strands, using 2 instead of the 6 that make up a piece of floss. So – this is a reaaallly crammed lil elephant that is not properly counted/stitched. Mom has this hanging in her bedroom and refuses to acknowledge how crap it is. So0o0 much better. My first Satsuma Street pattern, who is my absolute favorite pattern-maker by far. Find her Etsy here. lil weiner stitchin’ for my dachshund obsessed boyfriend. Another beauuuutiful Satsuma Street pattern. Momma’s birthday present last year! Took FOREVER to do and you can see my spacing totally failed and I had to improvise in a couple places, but she cried when she got it in the mail. Do all Moms cry over things like this? Another headache inducing stitch, but my favorite so far. 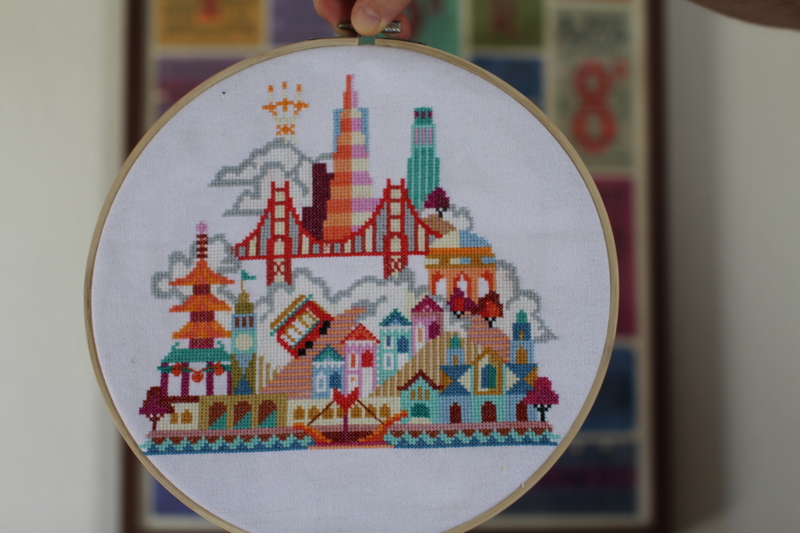 San Francisco pattern from Satsuma Street. Took me three weeks to get this guy done but I love how this one came out. 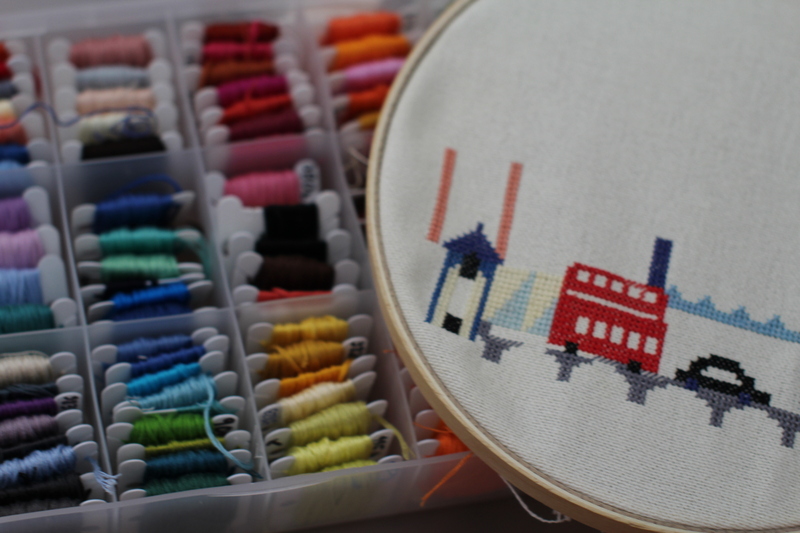 The current work-in-progress is London from Satsuma Street and Halloween Sampler from Frosted Pumpkin (which I’m too lazy to take out of it’s hoop).